Click the link above to register. Sign up by August 26! Please download the schedule before committing to attend. The schedule will also explain what to wear, what you need to bring, and where and when to show up. Alumni: Register HERE through the UO Alumni Association. You do NOT need to complete this survey. Specific audition materials are linked below. Auditions will be grouped by instrument so you will not need to be there the entire time. Specific times will be announced before May 18th. If you are an incoming student, you may send in a recording, but live auditions are encouraged. Scholarship: Green Garter Band members who meet all membership requirements receive a yearly scholarship of $6300. Yellow Garter Band members receive a $1350 yearly scholarship. Eligibility: The Garter Bands are highly active groups with demanding performance schedules. To be eligible, you must be a full-time (12 credits) University of Oregon student actively working towards your degree. You must also be a member of the Oregon Marching Band and the Oregon Basketball Band. Green Garter Band members must have at least 1-year prior membership in the OMB; Yellow Garter Band members do not need prior membership. Garter Band obligations begin in September and may run into June each year. Please refer to the audition instruction sheet for complete details. Are you considering joining the OMB? Join us for the Spring Game! Come play with the band at the 2018 Spring Game on Saturday, April 21! Are you planning to join the 2018 OMB Percussion section? Sign up for the 2017 Pick Up Band! April 29th is the Spring Game! Calling all current OMB members, high school students, and Alumni! 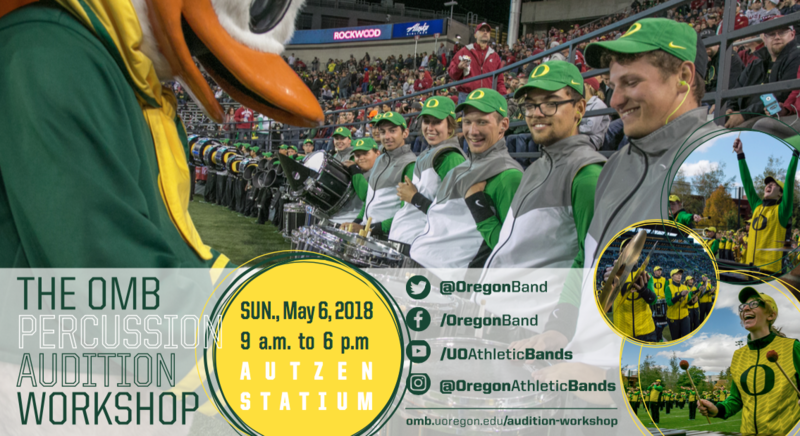 The Oregon Spring Game is an annual event where the Oregon Football team scrimmages for a televised exhibition game, so we put together a band to play both teams on. We are inviting current students, alumni, and high school students to come play! Once you have filled out this survey, we are expecting you to attend. Please contact us at omb@uoregon.edu if you need to change your availability. You have until April 26th to register! What to wear: A (preferably Oregon) green OR yellow t-shirt and blue jeans. Instructions: If driving, park in Lot 8/9, early arrival and carpooling is STRONGLY encouraged. Enter through the East Gate. Only those who signed up before Wednesday, April 26th will be on the gate list. If you are playing drums or sousaphone, be sure to arrive at the earlier check out time. 10:00am Call time. Stands rehearsal. 1:00pm Approximate end. Return borrowed instruments and flip books. While the Oregon Basketball Band students are away over winter break, the Alumni Band takes to the MKA stands and keeps the crowd entertained. If you’ll be in Eugene this winter, dust off your instruments and join us—high school and college musicians are also welcome to join! *Times listed are tip times. Arrival times are typically 80 minutes before tip time (1 hour and 20 minutes). Please register three days prior to the games in which you would like to participate to ensure that your name is added to the gate list. Visit the event page, click the registration button below or call 800-245-ALUM to register. For additional information, contact Nathan Irby, BM ’11, MMUS ’13 at nwirby@gmail.com.